As the headline in the news remind us daily: immigration in the U.S. is an important policy topic of today. There is a high dependence on the U.S. as haven for refugees and people seeking a better life. However, the popular rhetoric used by the media is that the decision is based largely on economic opportunities. Now the recent immigration situation has shifted this rhetoric and resulted in a better understanding of why immigration occurs. Not just for economic opportunity, but also for reasons like asylum seeking due to other more impeding factors such as extreme crime and corruption. Thus, the demographic of the current migrant caravan has a wide range of different backgrounds. The news has provided a surplus of articles on the migrant caravan, but few mention how immigration from Latin America to the U.S. effects the Latin American economy. Thus, this article will include a discuss on this, as well as how certain types of immigration impact the economy differently. Immigrants from Mexico and Central America tend to be a younger demographic with a lower education level. Averaging 20 years, they tend to migrate and work lower-skilled jobs with lower wages. A causal factor of lower skilled immigration is often correlated with high levels of crime, corruption, and political and macroeconomic instability in their country and/or community. This dynamic contrasts with the Caribbean that has been a victim of the “brain drain” where most of their highly skilled workers leave in order to seek out greater economic opportunity (Cerovic and Beaton, 2017). One commonality that both forms of immigration have on economy growth within a country is that it leads to a reduction of the labor force. With the countries that are experiencing a “brain drain,” this weakens a country’s ability to grow. However, both low and high skilled immigrants send home money to their families. This increases the finances for trade and investment within Latin American countries that may be struggling. Nevertheless, home countries of lower skilled immigrants experience a greater benefit from these remittances. Specifically, this negative impact on growth that occurs due to immigration is not compensated by the remittances sent from the highly skilled immigrant population. With those of the lower skilled immigrant population, their families and the economy experience gains from the money sent home because they earn higher profits for their labor in the U.S. Often these jobs are similar to their home country jobs (if applicable), but they provide a greater profit. Thus, in the countries that experience lower skilled worker immigration, the economy and personal income is predicted to grow due to immigration (Cerovic and Beaton, 2017). Economic growth due to remittances from immigration is a relatively stable strategy. Specifically, remittances are viewed as a valuable source of income for countries who are experiencing an unstable or lagging economy. An example of this is when natural disasters occur in the Caribbean leaving many people displaced. When this happens the economy struggles with funding and look to outside countries for help. For this reason, immigrants send more money home than usual to help their local families and communities. Therefore, remittances help to support financial stability of the affected Latin American countries (Cerovic and Beaton, 2017). Not only do remittances help support financial stability at the household level, but also they spread to assisting the government and national economy as a whole. For example, this money increases the ability of borrowers to finance and repay their loans. This promotes the stability of the banking system. Also, the government experiences more revenues from these remittances since consumption, savings, and investment increase with this inflow of household income. Finally, in the case of Mexico and Central America, since the lower skilled population make up the majority of immigrants the remittances they send home are likely going to those of the lower income population. Therefore, immigration and remittances help to reduce poverty and inequality (Cerovic and Beaton, 2017). The current immigrant caravan consists of mainly people from Honduras, Guatemala, El Salvador, and Nicaragua that are seeking asylum from persecution, poverty, and violence. Some immigrants say they are threatened by criminal gangs that are located in their communities. A smaller population of the immigrants solely are moving for economic opportunity and the ability to send remittances back to their families. However, a majority of the population are seeking asylum. Under international law if one is seeking asylum due to the threat of persecution, then they are a refugee who is entitled to a hearing. Those escaping poverty and are in the pursuit of a better life do not receive the title: refugee (Migrant caravan, 2018). Thus, this recent immigrant caravan is initiating discussion on immigration for purposes outside of the category of economic purpose. These people are volunteering to surrender in order to earn asylum. This opens up the less popular conversation on the immigrant population’s experience with crime and corruption, as well as their perspectives of insecurity and their satisfaction with the efficiency of their home country’s democracy (Hiskey, 2017). With this shift in the purpose for immigration, the usual effects on the economy may vary. The skill level demographic of this current immigrant caravan is expected to consist of a majority of lower skill levels. This is in part due to the correlation between higher levels of crime and communities of lower income (and skill) levels (Sackett, 2016). Nevertheless, the majority of immigrants plan to send whatever remittances they can home to family they left behind. Thus, the expected economic benefits from this type of low income worker immigration are proposed to occur in the future for their home countries (Hiskey, 2017). Immigration can benefit both home countries and receiving countries despite the media’s tendency to promote misconstrued ideas about this topic. Immigration of lower skilled workers helps the home country’s economy because of the positive externalities that stem from remittances sent home. The receiving countries benefits from lower skilled workers because they are willing to earn lower wages for jobs. In terms of economics, this increases productivity and efficiency, and promotes natives to specialize in more productive enterprises. Thus, this form of immigration can be labeled as mainly beneficial for the economies involved (Bier, 2012). David Bier. (September 12, 2012). 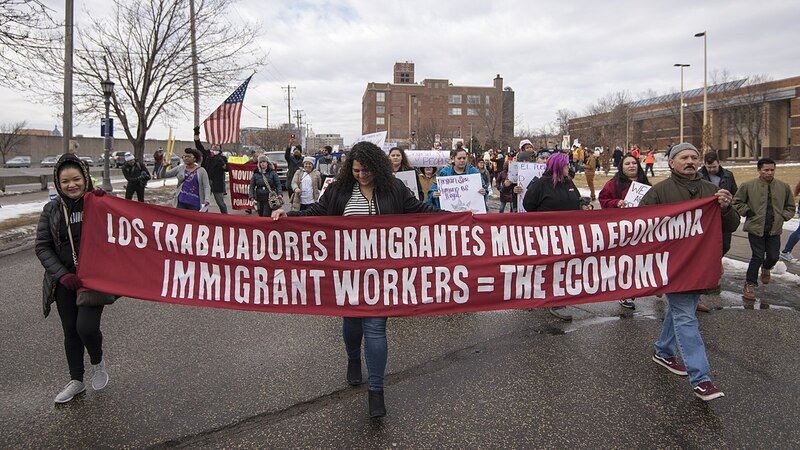 "Low-Skilled Immigrant Workers Are Vital Contributors To The Economy". Forbes. Chase Sackett. (Summer 2016). "Neighborhoods and Violent Crime". U.S. Department of Housing and Urban Development. N/A. (November 26, 2018). "Migrant caravan: What is it and why does it matter?". BBC. Jonathan Hiskey. (April 5, 2017). "The face of Latin American migration is rapidly changing. US policy isn’t keeping up". Svetlana Cerovic, Kimberly Beaton. (June 29, 2017). "Migration and Remittances in Latin America and the Caribbean: Brain Drain Versus Economic Stabilization". IMF Blog.